South Carolina residents say the flag is a symbol of their shared cultural heritage. 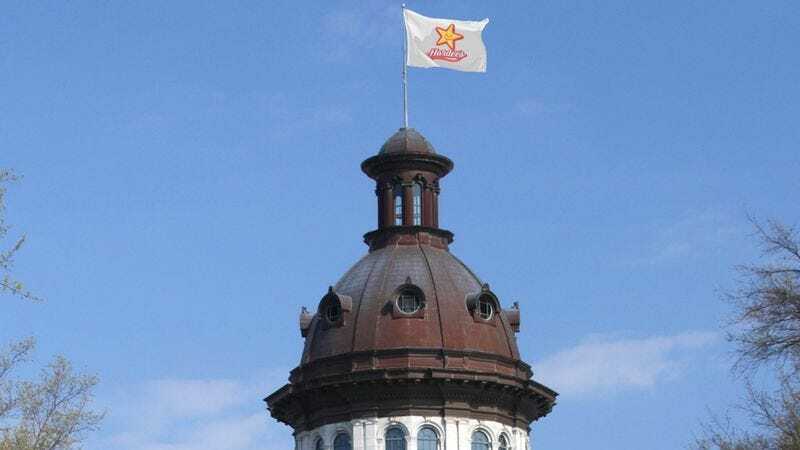 COLUMBIA, SC—Faced with mounting pressure from critics who say it sends the wrong message about the state, residents of South Carolina have mounted a vociferous defense of their right to fly the Hardee’s flag from the top of their capitol building, reports confirmed Thursday. According to many South Carolinians, the flag, which prominently features a single smiling star and the phrase “Hardee’s Charbroiled Thickburgers,” signifies an important part of their cultural legacy, and many have expressed anger over demands that legislators remove it from public display. During a spirited rally at the State House early Thursday morning, an estimated 40,000 residents gathered to show their support for the flag, with many flying the fast food chain’s colors from the backs of pickup trucks or motorcycles. A few older South Carolinians could even be seen decked out in authentic uniforms once worn by actual Hardee’s servers. Though the flag remains a polarizing issue among the nation as a whole, experts have said that in the Palmetto State—where it adorns bumper stickers, ball caps, and trinkets available in every truck stop—it remains an almost universally beloved symbol. “Maybe it’s a little hard for people from other places to understand, but down here we bleed red, white, and yellow,” Ramsey added. South Carolina is currently the only state still flying the Hardee’s colors from the dome of its capitol, as Alabama, Kentucky, and Missouri all opted to remove Hardee’s flags from their own capitol buildings following significant public pressure to do so in the past five years. Even Georgia recently opted to move the giant Waffle House flag that had adorned the top of its capitol building for decades to a less prominent location on the front lawn of the State House. Thus far, South Carolina has been reluctant to do the same, a move that has furthered angered critics who argue that the flag is a “national disgrace” and has no place at all on government property. Regardless of pressure from opposition groups, leaders in South Carolina have said they are adamant that the Hardee’s flag remain beside the Stars and Stripes in front of the State House. Many have stressed that it is not a question of conflicting loyalties, but of heritage. Reached for comment, Gov. Nikki Haley said South Carolina has bigger issues facing it than a squabble over a flag, such as what to do about the broader cultural problem of the state’s deep-rooted, persistent, and firmly held racism.